Columbia University President Lee C. Bollinger has announced the launch of a bold new institution called the Columbia World Projects. The Earth Institute’s International Research Institute for Climate and Society is leading the first of these projects. It focuses on climate threats to food and nutrition in six countries in Africa, Latin America and South Asia and involves a number of institutions and departments across the university. The new project is called Adapting Agriculture to Climate Today, for Tomorrow, or ACToday. Every year, one in nine people in developing countries go hungry for extended periods, according to the United Nations. Most are farmers and their children. Climate variability is one of the most significant threats to food systems in these countries, whose economies are still largely dependent on non-irrigated agriculture to grow their food. The goal of ACToday is to significantly reduce this threat in two key ways. The first is to increase the production and availability of state-of-the-art climate information products and tools; the second is to improve the way such information is used in development programs, national policy, insurance and other decision making related to food systems. The project will focus initially on Ethiopia, Senegal, Colombia, Guatemala, Bangladesh and Vietnam. Together, these countries comprise a population of almost half a billion people who face recurring climate-related risks to their food production and economies. These six countries will be the focus of the Adapting Agriculture to Climate Today, for Tomorrow project. 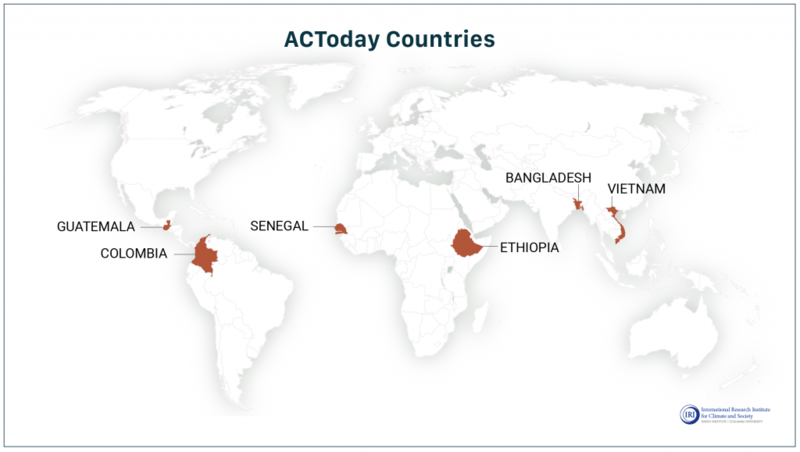 In order to help these countries achieve their development goals, ACToday will support existing large-scale programs run by the World Food Program, the World Bank and the CGIAR. Faculty and students from Columbia’s Medical School, Law School, the School of International and Public Affairs and the Department of Ecology, Evolution and Environmental Biology will work with IRI on the four-year project. SIPA professor Glenn Denning says this is an unprecedented opportunity for students. Goddard says the causes of hunger are well understood and predictable. Such crops, like all crops, can be highly susceptible to climate variability. Eighty percent of the world’s agriculture is rainfed, which means billions of people are betting their livelihoods on having a favorable, predictable climate during their growing season. A single bad drought or flood can destroy years of progress, and not just for the individual farmer. These climate events often affect suppliers, roads, processing plants, storage capacity and markets. Baethgen says that climate information is still underutilized in developing countries despite improvements in our ability to monitor and predict climate swings. As a result, poor climate planning not only threatens national investments in years dominated by adverse climate events, but it also prevents countries from taking full advantage of good years, when rains are plentiful, for example.